New Westminster Schools recognizes and acknowledges the Qayqayt First Nation, as well as all Coast Salish peoples, on whose traditional and unceded territories we live, we learn, we play and we do our work. 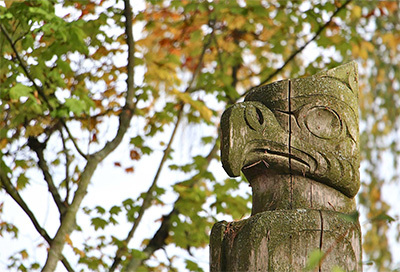 The Board of Education of New Westminster Schools believes that acknowledging Traditional Territory is a way to honour and show respect to the original inhabitants of this land. This practice enables the wider school and district community to share in Aboriginal cultures, and leads to better relationships and understandings. Observing this practice connects participants with the traditional territory, and provides a welcoming atmosphere to the land where people are gathering. Chief Rhonda Larrabee of the Qayqayt First Nation in New Westminster is a passionate believer in education, offers a traditional welcome at many of New Westminster School functions, and often shares her story with the school children of New Westminster. In the 19th century, a village alongside of what is now Front Street in New Westminster was called Qayqayt (pronounced Ka-kite). In 1859, New Westminster City Council sought to remove the First Peoples from the city core, creating three reserves in the surrounding area, including 27 acres of Poplar Island and 105 acres across the Fraser River at Bridgeview. A smallpox epidemic killed many First Peoples in 1904; in 1916, the McKenna McBride Commission closed the New Westminster Indian Reserve and told the residents to move. Many reserves in British Columbia were being closed at this time, most without compensation or alternative lands to help them move. Qayqayt from New Westminster were married into or adopted into other Nations, relocating to Musqueam, Squamish, and Washington State. The story of the Qayqayt was almost forgotten. Sharing her story with the school children of New Westminster continues to have a major impact. The New Westminster School District is proud to have a partnership with Chief Larrabee and her band. Chief Larrabee is a member of the New Westminster Aboriginal Education Advisory Committee. (Adapted from “A History of the New Westminster Indian Band”, 2004).